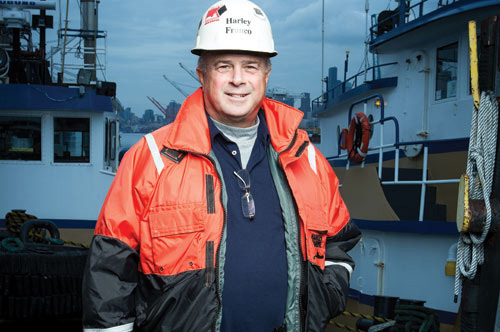 Harley Franco’s Seattle-based holding company runs a fleet of tugboats and barges that deliver oil by sea to ships in harbors across the country. By building what he says is the safest, cleanest, greenest marine services company in the region, Franco has garnered a huge share of the oil delivery business of the large oil companies. Here he is in his own words. EARLY YEARS: My dad had a grocery store in Seattle. I studied business at the University of Washington, then went to law school at Lewis and Clark College [in Portland]. I didn’t like to work as a lawyer, so I went into the telecommunications industry. It’s a tumultuous industry [where] I learned how not to do things. They would make an acquisition, say it was because of the people, then fire everybody. THE COMPANY: My friends had a tugboat company in Aberdeen. That didn’t work out, so we created a partnership. I needed a job and it was the right time to invest in myself. That was in 1987. We built up the company, Olympic Tug & Barge, one boat, one contract at a time. We wanted sustainable growth. We wanted to build great people and systems. Once we got the system down in Seattle, it was easy to move into the Bay Area, Los Angeles and Houston. Our customers are the shipping lines and the oil companies, and they asked us to move into those markets. Now we have 135 vessels and 600 employees. By the end of 2014, we’ll have 150 vessels. NEW HEADQUARTERS: I’m a Seattle boy, and I’ve worked very had to grow this international brand. I wanted a legacy, an iconic building that stands for being green. This [Harbor Island building] is the jewel of the harbor. It cost us about 20 percent to 30 percent more to make it LEED gold certified with solar panels and lots of recycled and reused materials. Our employees wanted a safe, cheerful, light-filled environment to work in. The building will help us get better people and offer better service. SAFETY: When they think of oil and water, people think of the Exxon Valdez. Oil has to be respected. We had a barge sink 27 years ago. We contained the spill so there was no environmental damage. But we learned from that. Now everything is based on prevention. We deliver oil in double-hulled steel barges. If anything goes wrong, if someone stubs a toe or a fuel line breaks, we investigate and work like heck to prevent it from ever happening again. We provide a lot of training and oversight. We reward people [working] on vessels with no incidents. We have less oil spillage, fewer injuries, less damage to docks than other service providers and our insurance rates reflect that. The real [pollution] problem in Puget Sound is people who top off their car tanks and the rain washes that [gasoline] into the water. BIG OIL: Ninety percent of our work is for oil companies — and they have demanding standards. If you are going to refuel a ship, you want it to be us. Our emphasis is on being clean and safe. We have more than a 60 percent share of the business on the West Coast, and we are gaining share on the Gulf Coast and the East Coast. IMPROVEMENTS: We are always looking for better ways to do things. We moved from steel cables to lighter, synthetic materials for ropes. That saved a lot of backs. We are looking to use cleaner materials like biodegradable lubricants. We have hybrid tugs now and we are looking at LNG [liquefied natural gas] tugs. We are doing our homework. We recycle and compost on tugboats and use hybrid vehicles with greener engines. PEOPLE: You know good managers when you see them. Our vice president of operations went from the wheelhouse to management. He brought field experience. GROWTH: There is not a lot of growth in the West. In Houston, there is lots of land and it’s business friendly. They are growing like gangbusters, trading everything from chemicals to petroleum and grain with Central America, Latin America, Europe and Asia. It’s becoming a hub. INTERNATIONAL: We are expanding internationally. We have two self-propelled bunker tankers in Singapore. In Pusan [South Korea], we are working with oil companies to build an oil terminal. We have experience from managing a tank farm in Portland that stores fuel and blends it for bunkering. We’ve also been asked to do work in Venezuela and Peru, but we can’t do everything. LOCAL PORTS: Tacoma is set up for growth. It has more land for industrial use. Tacoma is like Oakland. Seattle is more like San Francisco, with all its cruise ships. [But] Seattle has other commercial advantages. [For example,] Vigor Shipyards is one of the few places where you can haul a ship out and do work on it. Seattle isn’t a big port, but why not make it the best? Keep it as a jewel. If it’s safe and efficient; it can be a good alternative to L.A.